As sea levels rise and livable landmasses shrink, the Reorganized United States of America has instituted population control measures to ensure there are sufficient resources and food to sustain the growing population. Birth authorization must be paid for and obtained prior to having a child. Someone must die before another can be born, keeping the country in a population neutral position at what experts consider to be the optimal population. The new laws are enforced by a ruthless government organization known as Pop Con, responsible for terminating any children resulting from unauthorized births, and any illegals who manage to survive past their second birthday, at which point they are designated a national security threat and given the name Slip. But what if one child slipped through the cracks? What if someone knew all the loopholes and how to exploit them? Would it change anything? Would the delicate resource balance be thrown into a tailspin, threatening the lives of everyone? And how far would the government go to find and terminate the Slip? 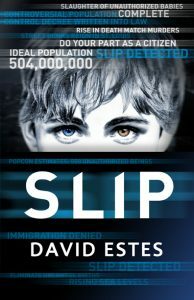 In a gripping story of a family torn apart by a single choice, Slip is a reminder of the sanctity of a single life and the value of the lives we so often take for granted.